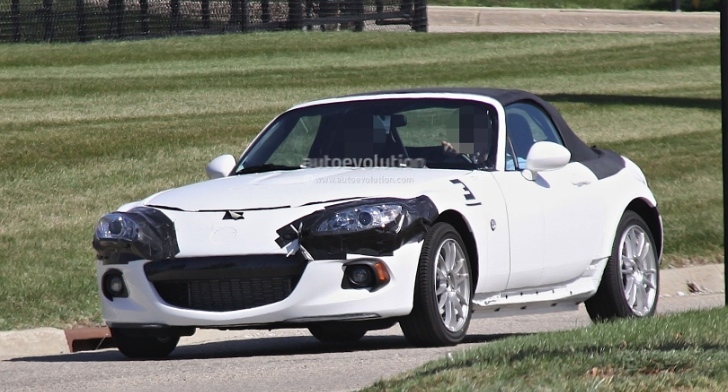 Mazda and Alfa Romeo were caught testing their next-generation collaboration effort last month in the form of an MX-5 mule in America. The two manufacturers are putting their heads together to produce both the next MX-5 and Alfa Spider sports convertibles. Using a heavily modified and disguised version of the Japanese firm’s popular soft-top, test drivers and engineers were caught putting it through its paces. Despite joining forces to create both cars, the two will utilise their own engine variations. The Mazda is set to use a naturally-aspirated unit producing around 130bhp, about the same as the current 1.8 option, but Mazda intend to use a more efficient 1.6 SkyActiv derivative to rein in CO2 levels. There are also strong rumours that a diesel engine will be considered for the first time. Alfa Romeo, meanwhile, will likely place their own 1.4-litre TB MultiAir engine under the bonnet, a unit currently offered in the Giulietta in 119bhp and 168bhp guises. No one would be surprised to see the Italian firm place the new 4C’s 1750TB engine in the Spider as a further option, with power expected to range from 120bhp to 237bhp. A six-speed manual gearbox is expected to be fitted as standard in the two cars, but a paddle-shift six-speed ‘box is also on the cards. Around 40 per cent of the cars’ components will be similar to each other, a percentage rather low for such a partnership with a usual commonality value expected to be more around 60 per cent. The current Mazda MX-5 is remains a very capable car, and you can take a look at the latest offers over at the RRG Group.